Don’t be fooled by big Charter Broker sites. We own our own planes based right on Teterboro Airport. 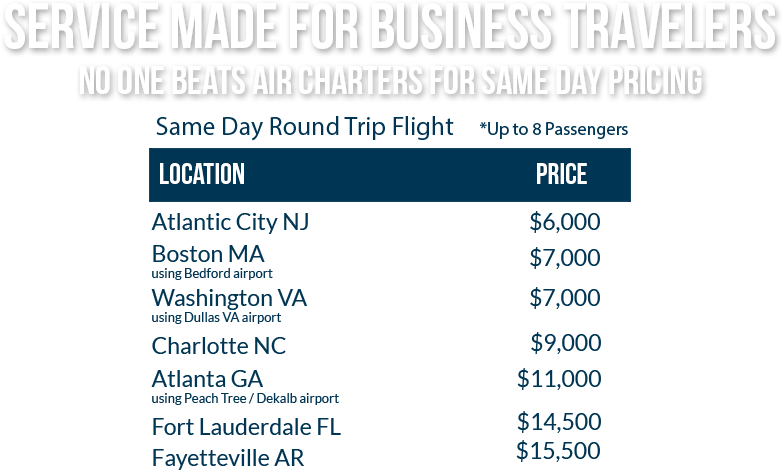 Thus our business charter rates can be winners for many destinations. One-Call Transportation Scheduling Door to Door. Multi-Stop, multi-day packages for corporate roadshows. For speaking engagements, conventions, board meetings, or team building events. When 1st class isn’t good enough, take your family or team on vacation in style. Fly where you want, when you want, in complete privacy. Ski and Resort Destinations across North & South America and the Caribbean. Senators, presidential candidates, celebrities, professional athletes, newlyweds and sportsmen have all relied on Air Charters to deliver them safely, and in supreme style. Celebrity Transportation to/from shows and events. Super Bowl and World Series Charters. Groups going to Remote Weddings & Bar Mitzvahs. Yes, you heard that right. When you charter your trip with us from Teterboro Airport, you won’t pay expensive broker fees or additional costs to move the plane from some other airport to here. 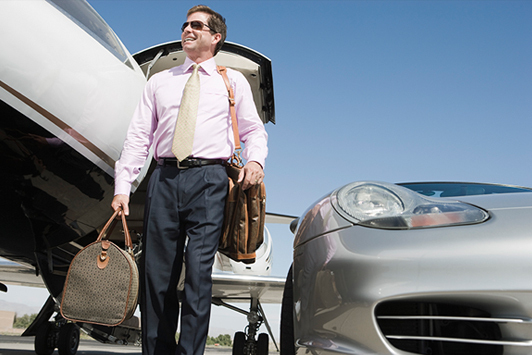 Air Charters Owns its own fleet of planes and you are dealing directly with our executive team every step of the way. Air Charters is the only full service Jet Charter Company that is actually based on the tarmac at Teterboro Airport. Whether you’re an operator, broker, or flight department, Air Charters is the perfect partner for your New York area departure. We are highly cost effective for departures from Teterboro Airport, but also Newark, LaGuardia, Kennedy, Morristown, White Plains, Bridgeport, and New Haven Airports . We routinely put our pilots in the air within 2 hours notice or less and our planes hangar on the airport at Teterboro. Air Charters is the most affordable, safe, and efficient partner for your custom travel originating in the NY area. We are a full service private jet charter and jet aircraft management company serving the New York Metro area for over 30 years. We own, operate, and maintain a fleet of charter-ready jets based right on the tarmac at Teterboro Airport. Our planes don’t have to be “relocated” to Teterboro to accomodate your travel plans and our 24/7 on-site maintenance crew means you can fly as soon as 2 hours from giving us a call. If you need a larger jet, Air Charters provides access to virutally any size jet charter you require. We are the ONLY call you need to make to arrange your door-to-door custom travel itinery to anywhere in the Americas, Canada, or the Carribean. Please complete the information below and an Air Charters representative will contact you. Call 201 288 9000 For An Immediate Quote.